• I feel like a broken record. A new environmental study urges people to eat far less meat and cheese. This one is interesting, though. 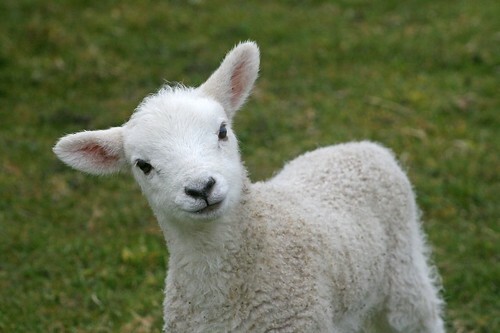 Unexpectedly, the biggest offender when it comes to GHG emissions is lamb! Lamb is a whopping 50% worse than beef. Damn! What sicko eats a defenseless, cuddly baby, anyway? Macho men, that's who - guys who are tough enough to stand up to a dangerous creature like a lamb! Take that you puffy, fluffy, gentle threat to my manhood. The Environmental Working Group (EWG) released the Meat Eater's Guide to Climate Change and Health, a comprehensive study warning Americans that the extreme amounts of meat and cheese we eat take a huge toll on the environment, animal welfare and human health. Meat and dairy products require more energy and resources to produce, and generate more toxic waste and pollution than equivalent amounts of potatoes, rice, beans and other plant-based foods. According to the EWG, if everyone in the U.S. chose vegetarian foods over meat or cheese for just one day a week, the reduction in greenhouse gas emissions would be the equivalent of taking 7.6 million cars off the road per year. • Every year, two million homeless or captured South Korean dogs are butchered and eaten. They are often electrocuted, strangled, or bludgeoned to death and are then skinned, chopped up, and boiled. The cruelty and suffering endured by these dogs is unimaginable. Even though the country's Animal Protection Law, which was passed in 1991, considers dogs to be "domestic pets, officials often turn a blind eye and allow this to continue . Click here to find out more and help.